Is this the explanation of Common Core? The post below is from a teacher about her first few days teaching Common Core. She writes about the training received on CCSS teaching methods and bursts the CCSSO talking points that CCSS doesn't tell how/what teachers need to teach. The amount of stress on teachers and students forced to adapt to these mandates (not voted on by voters or legislatures) may, in fact, create a demand for 21st century jobs. Read the article and see if you can guess what job might be the number one profession in the next decade. 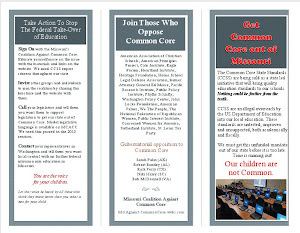 In this post I write about my experience as a traditional public school teacher facing Common Core (CCSS). Before I do so, there are a few statements I must offer. First, let me be clear that I am writing about my own experiences on my own blog using my own computer and sitting in my own home on my own time. Second, I teach in a wonderful school for an administration that cares about their students. The atmosphere at my school is one of undeniable support. Our school is a strong community, one that is always seeking to grow. My district has a solid, established reputation statewide. Third, if I am going to endeavor to teach my students to think critically and to act with conviction, I must first model as much myself. And now, for my experience with CCSS. In 2010, I attended my first department meeting in which I was told our district would be phasing out our curriculum and phasing in something called the Common Core. I was told that it would be simpler for having fewer objectives. We were to phase in slowly, with the transition being complete for the 2014-15 school year. I was also told that there would be assessments but that these were not written yet. This was two years prior to passage of legislation that my job would depend upon student test scores, so that issue was not part of the discussion. In other meetings, I was told that CCSS required that I teach differently; the example given then was about some new way to do math. I am not sure why this was presented in an English department meeting, but it was. Last year was our first (and, it turns out, only) transitional year. The curriculum reminded me of moving from one house into a temporary residence on the way to Who Knows Where. Our curriculum specialist tried to help us choose materials for this curriculum in transition. We used what books we had available. This was also the first year that teachers were evaluated using student test scores. I was very aware that I had little control over how my students fared on the End of Course (EOC) test. My goal was to teach; this I kept as my focus. I learned upon returning to school this week that we were no longer “transitioning.” We were now completely CCSS. 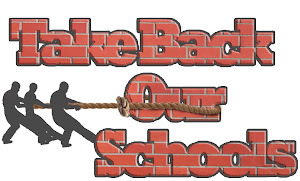 This year my students will take EOC; my job this year will be contingent upon EOC; PARCC will begin next year. US Secretary of Education Arne Duncan has been on a crusade for states’ not dropping out of CCSS. Thus, it makes sense to me why John White dropped us in full-blown CCSS a year early: foot in the door. White figures that CCSS is less likely to be dropped in Louisiana if it is already instituted. Wait until the legislature feels the weight of that PARCC price tag. I think we might be following Georgia’s lead. 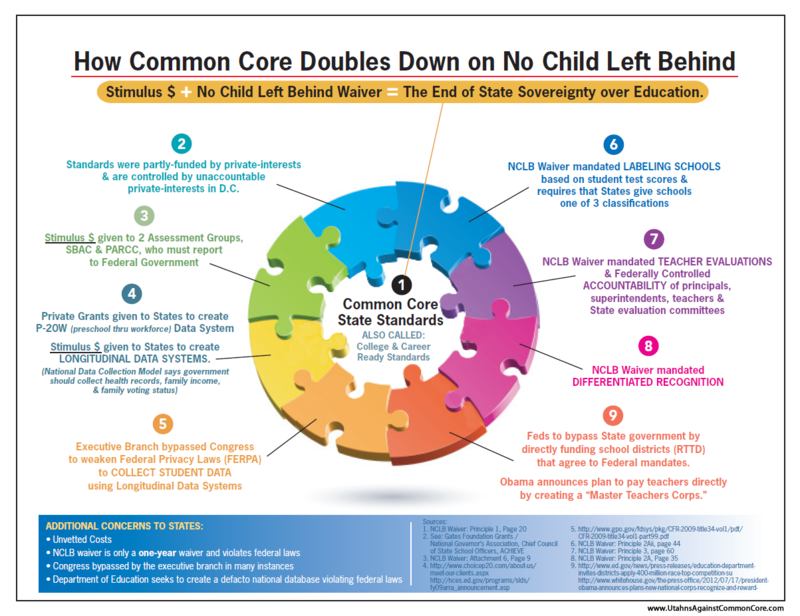 CCSS is a top-down adoption. Notice how many times the word “told” occurs in this post. Obama and Duncan told states that they must adopt CCSS to be eligible for Race to the Top (RTTT) funding. At the state level, the “collaboration” came after CCSS was established; the word is that CCSS was adopted “with overwhelming support from the public and from educators.” Our district told us what the new material was that I would use for teaching, and they told us that veering from the approved literature would require principal/district approval. That brings me to the “telling” at the school level. My first meeting during our three beginning-of-year teacher days was a meeting on CCSS. It reminded me of a time-share sales pitch. I was told that I had freedom in my classroom. I was told that my classroom was my “car” and that I “have the keys to my car.” I was told that CCSS would not require extra time or preparation. I was told numerous times that if students did not excel, it was that I was failing the student. I was told that students would learn if only I would provide the opportunity. I thought of the numerous students last year who told me, “I’ll just take the zero” on the periodic grading of their semester-long research project until they reached the point that they had to complete the work in order to earn a C or D.
I was told that I need to challenge students by bringing them to their “frustration level”– that doing so would challenge them to work and that they would rise to the occasion. I envisioned students throwing up their hands in resignation and transforming into behavior problems. I remembered that CCSS had not been pilot tested. In a second meeting on CCSS, I was told that we would focus on literacy across the subject areas. In order to do so, we were expected to regularly do an activity called a “close read.” In the two-hour meeting, I learned that the close read activity had a number of components and that it would take hours of class time to complete. I imagined my classroom “car” to which I “had the keys” as being without wheels, on blocks. I was also told that we would be regularly be expected to write ”text-dependent” assignments using a template provided by a company called Literacy Design Collaborative (LDC). I was told that PARCC has a lot of text-dependent questions, so I needed to use this template to create a text-dependent writing assignment for students as often as (the unofficial expectation) once a week. In instituting this unpiloted CCSS, I realize that my classroom has become one high-stakes experiment. My goal is to walk the CCSS tightrope as best I can out of respect for administration while continuing to guard and exercise my professional judgment. My prediction for the number one 21st century job will be that of a mental health counselor based on how CCSS is structured: authoritarian, increased standardized testing and instituting unrealistic expectations (decided by a centralized private group) on adults for children's educational outcomes. I was told numerous times that if students did not excel, it was that I was failing the student. Sounds just like a communist approach to education to me. You'll lose more than half of the students and probably as many teachers. Maybe the intent is to force kids out of the free education their entitled to and force them to either pay for private schools or drop out. There is no "maybe" about this! As soon as NCLB was enacted and corporations realized there was big money in standardized testing, the snowball started rolling and has been picking up speed ever since. If anyone doubts this, look into the money Pearson has made selling the tests and related materials. There is even more money to be made by Gates with all the testing that is going to need to be done via computer. Software, hardware... it's Christmas at Microsoft now that Common Core is going forward in so many states... oops... can't say Christmas either can we?! Common Core is one of many reasons why I want to home school. Home schooling is on the rise. Government control and abuse of power in schools is a big reason why. Just wait for the day they say NO MORE HOMESCHOOLING. We cant have children thinking on their own! Home schooling is an obvious alternate, but the Common Core founders are manipulating all the college entrance exams to "align" with Common Core. Thus students not taught using the same standards and curriculum may have low rankings on college entrance exams. Thus look for colleges that don't place emphasis on Common Core compliant entrance exams. Students can test into community college and then transfer to universities and sidestep that. A pain - but it can be done. Maybe there will be more tradesmen. That's not so bad either. I am homeschooling now and can imagine that within the next 2 to three years, all State/federally funded schools will be no more than a step up from public school and completely common core aligned. We will be saving for a private school or trade school in hopes of that being affordable. ed, others are made to drink the koolaide and realize what it is, the courageous will homeschool and be the hope for our nation. Thank you for posting this. I too, work for a wonderful school with great administrators who try to inject a dose of common sense. But I too, fear the WAY CCSS is being implemented nationwide and district wide; maybe a good idea but of course Pearson et al just make big bucks on it while the teachers and students struggle. It is insane to hold teachers 100% accountable for student results, with factors beyond our control as mentioned here. Thank you for being brave enough to post this. I pray that God will bless you & protect you through this very frustrating time. We live in a county with a wonderful, Godly man as our county superintendent. I know that his hands were tied when the state started pushing this here in Alabama. I feel so bad for teachers & for the students. I am so surprised to learn, however, that there are some teachers who actually support it though! A man from our church works as an IT guy for our county school system. He has great concerns over some of the content that is being "slipped" in to Core Curriculum. He feels that it is very socialistic in nature & there is great potential for great problems down the road, as the result of it. Was Columbine not a pilot school for this? I believe it was! Are you kidding me? Are you about to leap that chasm? Also please read House of Representative Bill HR5 which passed the House and is now in the Senate. It addresses the DOE and also state control of education. It will need lots of support to get through the Senate. Unfortunately, the climate in Washington is that if it passes the House then it is suspect. Robert J. Have worked in Head Start schools for many years where the Federal Government had control of the curriculum taught. Since that control is now moving to the higher level schools it is no wonder that the Feds have pulled out from annually funding Head Start when they tracked these Head Start children once they began elementary schools and found there was no significant continuation of what they were forced to learn while in Head Start schools across the nation. Parents home school if you are able. Don't let your child become socialized by the Common Core education. Get educated yourselves on the harm it will have on your children. College has lost any "worth" that it ever had, and if they align their entrance exams to CCSS it will be worth absolutely nothing. Frankly, I'm convinced that O will use our children for his "domestic army" when they can't find jobs. It worked out pretty good for HItler--that's how he did it. What ever happened to parents who want to HOME SCHOOL their children who have to be certified in teaching in order to teach their kids. Maybe one day there will be a law nationwide that forces all parents to be certified in teaching what will all of you do then? If all children are taught differently then chaos will be, my advice is parents need to stop complaining and get busy with teachers and go to the Board of Education until they listen or is that too much for a parent and teacher to do on a daily basis? People can NOT judge all schools based on a few and until someone has evaluated all schools nationwide why are all you people so ANTI-PUBLIC SCHOOLS?